Fear not the Dark Night of the Soul any longer. Straight from the Vatican Office of Really Neat Inventions comes the Soul Light. 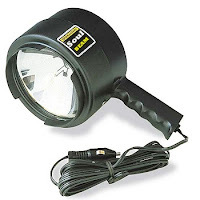 The Soul Light is guaranteed to provide a guiding light to any dark soul. After all, even the smallest of light chase away darkest of nights. Soul Light even comes handy clip that can be attached to backpacks, purses, belt loops and an array of other things to ensure you that you will never be without that extra bit of light in those times of darkness. Not only will Soul Light - II light the darkest recesses of you soul, but it can help guide a friend too. Have a friend in danger of being swallowed by the darkness? Sounds like you need Soul Beam. Soul Beam is one light that cannot be blown out and can certainly not be hidden under a bushel even if you try. Vatican Officials are reporting that the Soul Beam is packing a light wielding power equivalent to 300,000 lamp bearing virgins keeping watch for the bride-groom and wedding feast. Prices are currently undetermined, but there is speculation that one can acquire said light through regular daily prayer and mass.